I’ve been toying with the idea of addressing a particular issue for a few months now, but I never quite knew how to approach it. And then this week, almost as if giving me permission, I read Matt Walsh’s blog and figured it was time. Early in his post, Walsh talks about how we give trophies for everything now, especially mediocrity. I suppose that things have been going that way since I was a kid, although I was never a recipient of the “showing up” award. The first trophy I received (one of very few) was when I was fourteen, and it took me years to achieve it. 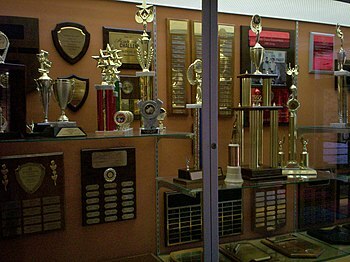 I felt underachieved, indeed, when I started dating my husband because his bedroom’s shelves were filled with trophies he’d earned for his athletic prowess. But I don’t mind my lack of accolades. Thomas and I know that we’re worthwhile people without all that. Besides, it’s better than doing the opposite and displaying junk of no value. I know someone who wanted to frame her husband’s military discharge papers. While not a dishonorable discharge, neither was it an honorable one. Summed up, it was basically: “You served your time. Thanks and good-bye.” Was that something to be proud of and display in a place of prominence? And while I have no problem saying these things about myself and other people, I can completely understand why the situation changes when you throw your own kids into the mix. I certainly want to applaud my children’s achievements. But what if they don’t have any? What if they do nothing exceptional, yet are surrounded by kids that do? Wouldn’t it help their feelings, give them a morale boost, to just give them a little something for showing up? It’s situations like this that make it very easy for people without kids to criticize those who do. But since I’m in that inner circle now, I can safely criticize – and hold myself accountable at the same time. Good parents (notice I didn’t say “all” parents) are forced to learn a whole new meaning of sacrifice and responsibility, and still there are no guarantees. The child who receives the best education may never get the big-paying job. The child who starts taking music lessons as a toddler may never get into Julliard. The child who is involved in sports from the age of four may never win a single trophy, and it’s a struggle to be the parent and just watch this happen. My husband is a natural athlete and is one of those kinds of people who could nap through school and still pass. I was an overachiever and earned academic scholarships without even trying in college. Neither of us had to study very hard. When I was pregnant with our first son, we focused on reading books that would help us raise a healthy and conscientious child. We weren’t worried about his academic skills. I mean, look at us. It was in the bag, baby. Peter started school when he was three, and I put him in two days a week. I daydreamed about my first parent-teacher conference, during which his teacher would tell me that he was her brightest star, knew all of his letters, and needed a bit more of a challenge than pre-school. Instead, she shared his assessment results, and they were on the low side of average. Nothing special, not to mention there were certain measures I needed to take to help him catch up with the other kids, some of which were close to a year younger. His behavior was fine, of course, and I know I should have been thrilled with that. But I felt distinctly like I’d done something wrong. The next year, when he was in pre-kindergarten full-time, his teachers were concerned that he didn’t know all his letters. I knew, with a new baby, that I hadn’t been as diligent as I should, so we pulled out the flashcards and got to work. To my dismay, as soon as Peter mastered a letter that caused him trouble, he would lose a letter that had never been a problem. Like there was a file cabinet in his brain that could only hold so much. Looking back over Peter’s early toddler years, I can see the pattern because I now know what is wrong. I would ask him to do a couple simple tasks, and he would only do one. I would get frustrated when he couldn’t name a letter that we’d just gone over. This otherwise compliant and well-behaved kid caused us both trouble when it came to following directions and academics. Extra tutoring over the summer before he started kindergarten did little to help, so I wasn’t surprised when his reading assessment at the beginning of the year placed him as one of the worst readers. When my husband and I went for the parent-teacher conference this year, it was with no illusions. I was prepared to apologize for falling down on my most important job but was met with empathy and compassion and a great deal of love from Peter’s two teachers. What was obvious to everyone in the room was that there was a problem, but it was something we could fix, since we cared enough to face it. My husband comes from a long line of dyslexic men, but it skipped right over him and landed on Peter instead. But the problem goes deeper than that. Peter’s working memory – what helps him remember to do two or more simple tasks at a time, among other things – only functions at about twenty percent of what is normal in a kid his age. The kid can remember trips we took when he was two, can build almost anything with blocks, and has a working vocabulary much more sophisticated than his six years, so I never would have realized it without a professional diagnosis. And there was also absolutely nothing I could have done to change this. In fact, I could have continued being in denial and berated him for being lazy, just perpetuating the problem. So what in the world does this have to do with sugar-coated broccoli? I’m not really picking on broccoli in particular. I mean, it’s obviously a very nutritious food, and although I don’t care for it raw, I love it roasted. But sweeten it up, disguise it under a layer of sugar, and – yuck. But isn’t this what our society does in so many ways? In the name of protection, we sugar-coat things for our kids and raise them to be adults who are ill-equipped to deal with reality. Congrats, you showed up. Think about how anticlimactic the Super Bowl would be if the losing team were also showered with confetti, awarded a trophy, and gave rings to every player? They worked hard to get there, which in itself is a reward, but they’re not the ultimate winners. I’m not saying that we should go out of our way to suppress kids, to not give them incentives to improve and perform their best. I’m also not saying that they aren’t special. Scientifically speaking, our DNA proves that each of us is unique, and people are certainly more than a string of genetic code. But none of them is God’s gift to mankind, and to treat them as if they are does them a gross disservice. There’s a fine line we have to walk, and although it’s difficult to do so, if we are realistic and honest about our children’s limitations and strengths, we can help them survive and even thrive in an otherwise unfair and cruel world. At six, Peter knows that he has trouble reading and doing some of the tasks that come easily to his friends. He also knows that he’s getting help but that there are other areas in which he needs no help at all. He also has an inkling that it’s a hard world, but I hope that I am raising a person who can help brighten it, even if he mixes up his M’s and W’s. It’s hard to admit that one of the most precious people in my world has a problem. But, although his story is nowhere near it’s end, it is moving toward a happy ending as we re-train his brain. I hope this gives other parents permission to face tough realities instead of turning a blind eye and continuing to reward average-ness and even serious issues. In Peter’s case, his rewards mark his progress toward realizing his full potential. Find your child’s strengths, and build them up to bolster the weaknesses. While a spoonful of sugar makes a great song, it does nothing to solve real problems.